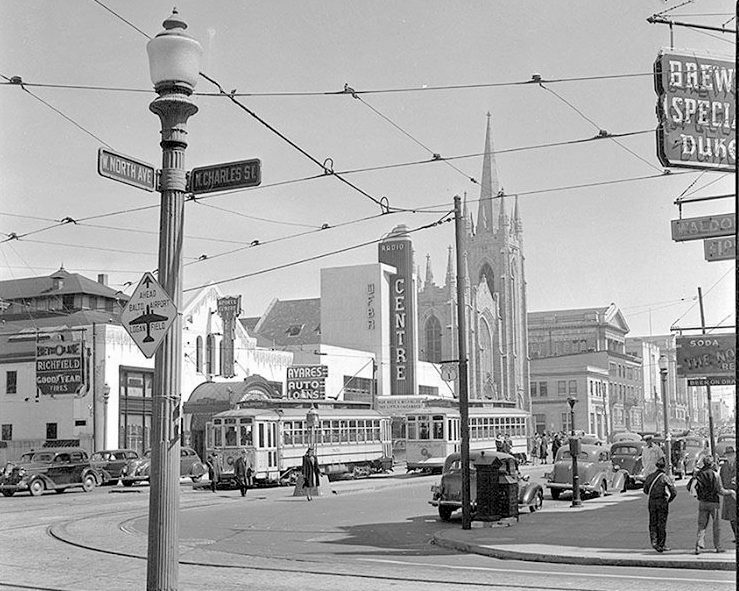 Above: At North Avenue and Charles Street circa 1940, we can see Sports Centre Ice Skating, the WFBR Radio Station, Centre Theatre, Seventh Baptist Church, Ayares Auto Loans and two streetcars. Why no mention in Wikipedia of F. Scott Fitzgerald’s years living in Baltimore’s Bolton Hill? Why nothing about Esther McCready, the trailblazing East Baltimore nurse who desegregated the University of Maryland School of Nursing? And as for the Great Railroad Strike of 1877, isn’t Wikipedia giving short shrift to events in Baltimore when it says the epic unrest began solely in Martinsburg, West Virginia? At a Baltimore Wikipedia Edit-a-thon scheduled this Saturday at Red Emma’s, anyone with an interest in correcting errors and omissions in Baltimore’s online history can join like-minded types to do so. “There’s a real lack of articles for a lot African-American history in Baltimore, civil rights history. Also women’s history is really lacking,” said organizer Jennifer A. Ferretti, an archives technician at the Smithsonian Channel who was previously curator of photographs at the Maryland Historical Society. The event is taking place at the book and coffee shop at 30 W. North Avenue from 2 p.m. to 5 p.m., and Ferretti invites archivists, history buffs or anyone with an interest in the project to stop by and join in. The first of the Wiki-editng meet-ups took place in July, attracting historians, archivists and librarians. It’s work that anybody could technically do on a computer on their own, but Ferretti, who said she experienced similar edit-a-thons when she was in graduate school in New York City, is looking to make it a lively monthly social event in Baltimore. Ferretti has created a Baltimore Wikipedians blog, with a link to a Google Docs spreadsheet that anyone can use to list projects they think need tackling or pages they think need editing. For those raised in the days of scholarly encyclopedia articles who might wonder about the wiki process, Ferretti says the Wikipedia system is more rigorous than one might think. A network of volunteer administrators polices new entries and pulls inaccuracies or untrustworthy material “really quickly,” she said. Other areas are aided by newly published material, like the information on McCready published as part of the Nursing School’s 125th anniversary. In most cases – as with the long-gone carousel and roller coaster at the Bay Shore amusement park in Edgemere, another missing bit of local lore – it just amounts to caring enough about something to want to tell its story.